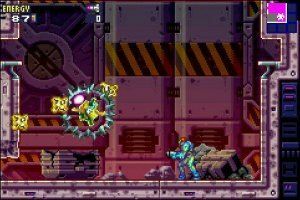 After the events of Super Metroid, Metroid Fusion brings back our hero Samus after a period of inactivity. After being attacked with a research facility, Samus is attacked by the X parasite and almost killed. Only an infusion of the Metroid DNA prevented her from total destruction. As a result however, Samus' suit has now taken on some organic properties and cannot be removed. The good thing is that it is upgradeable with all sorts of weaponry. 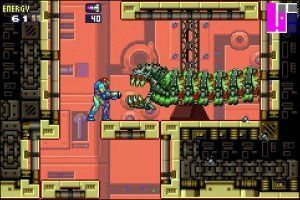 Whilst Samus lay recovering in a research satellite the facility is overwhelmed by the creatures of the X Parasite and Samus must go back into the fray and try to eliminate this enemy before the integrity of the base is challenged. The graphics on this title are amazing and really show off the power of the GameBoy Advance. It's funny but every time I see a new Nintendo title, I actually think that the programmers are truly learning how to best utilise code considering the size constraints of the cartridge. The degree of detail and colour really does credit to the gameworld, making it a most entertaining title to play. Controls have been mapped perfectly to the GameBoy Advance, naturally enough. This may seem like a silly comment to make considering this is a GameBoy Advance game, but sometimes the control setup for some of these games is ridiculous. Samus is easy to manoeuvre and the button layout is a very natural feeling configuration and easy even for the novice to pick up and play. Animations on the game are smooth and there is one new in particular that I especially liked. Samus can now grab ledges and smoothly vault up and over in an curled up ball, landing on her feet. It's a worthy addition and will mean that areas previously inaccessible will now be reached by gamers. Being a doppelganger type organism, X Parasite can clone whatever it touches, so basically there are many old creatures from the series available to battle as you make your way through the base. As you defeat each creature, it reverts back to it's original X Parasite form, providing a source of energy to Samus, who after surviving a near lethal attack is impervious to the parasite now. Samus' mission is controlled by her ship's AI that has been programmed to run her mission and pass on any communications. These are conducted via text and the entire story has been made interesting enough that it is worth reading rather than giving into the compulsion to skip the story. Be sure to seek out the weapons upgrades for Samus during battles with the smaller bosses. They significantly alter the way you play the game and have a specific purpose as far as gameplay goes. Players who are familiar with the series will notice that all the old favourites are here along with some nice shiny new ones for extra damage giving goodness. Audio is good though nothing really to rave about. Solid sound programming has been done and it certainly suits the game. It's just not enough to really make you sit up and take notice. 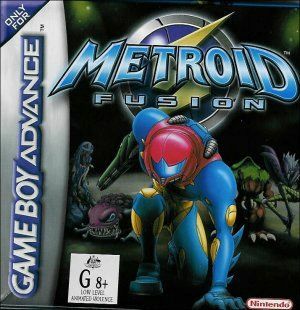 Gamers who enjoy this should be aware that the game will link up to Metroid Prime on GameCube with some fantastic Easter eggs for those who take the time to finish the game on both formats. You can even save your game onto the GameCube memory card according to Nintendo (Metroid Prime is not available in Australia at this time of writing). 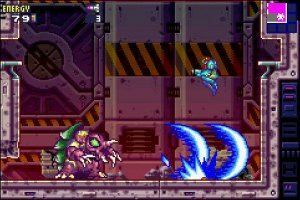 Metroid Fusion is a very strong title that GBA owners should have in their collection. It's a blast to play and is coupled with a good storyline that will compliment it's eventual compatibility with the GameCube. Nintendo has done it again!